Year-round, Vail is a traveler's paradise. It has been named “the king of American ski resorts” by Forbes. But the popular alpine town of Vail is so much more than just skiing. 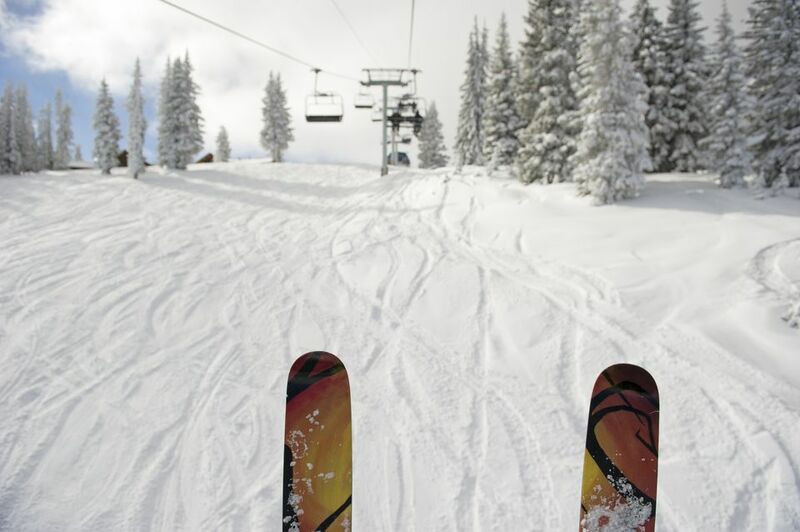 Here are the top things to do in Vail. Whether you’re visiting in cold weather or warm, there are plenty of adventures awaiting. This is obviously travelers’ top reason for coming to Vail. The mountain is huge, with 31 lifts and more than 5,000 acres of skiing, and while Vail is known for its super tough tracks, it really caters to all levels of skiers. One reason so many people enjoy skiing Vail is it sprawls across a single mountain, rather than a range, earning it the honor of “the largest single-mountain resort” in the United States. When the snow melts, the flowers pop out at the Betty Ford Alpine Gardens (named after former President Ford’s wife). This breathtaking, high-altitude garden at more than 8,200 feet above sea level is an explosion of colorful flowers, wild roses, and other interesting plants. While the garden is open all year long — and free to the public — the best time to visit is in the summer. Request a guided tour to learn more about the flowers and the nature of the region. Golfing is different up here. Avid golfers say the thinner air affects how your ball flies. Try it out for yourself at one (or more) of the region’s dozen-plus golf courses. We especially enjoy the views at the Sonnenalp Club, perched on a mountainside in Edwards, with dramatic views of Vail Valley and beyond. This semi-private country club offers 18 holes in a championship-links-style course. Best of all, the season is extra long here, from April through late October. While there, make sure to grab a bite to eat at Harvest, located within the club. Executive chef Rosa Provoste, of Chile, uses fresh ingredients in her internationally influenced cooking. While there are plenty of amazing places to stay in Vail, and there is also no shortage of outdoor adventures, the Vail Collective Retreat is where the two come together. The Vail Collective Retreats, located about 20 minutes west of Vail on 4 Eagle Ranch in Wolcott, is one of our favorite destinations in Colorado. Guests stay in safari-style, large canvas pop-up tents with open-air doors to the mountains and nature. It’s like camping, because you’re isolated, off the grid and surrounded by nature, but without any of the inconveniences. These tents offer extreme luxury, high-end amenities, top-notch service and even running water and a separate restroom (with plumbing) in a tipi behind your tent. While there are increasingly more glamping options around Colorado, this remains one of the very best. From the views to the comfort of the beds, Collective Retreats has perfected glamping to such a degree that few can compete. Take a scenic drive or take the Eagle Bahn Gondola up the mountain for a panorama of Vail Valley. In fall, the glowing aspen leaves will leave you breathless. At the top of the mountain, take time (and plenty of space on your camera) to appreciate the Mount of the Holy Cross in the distance. The views are incredible in every direction. Year-round one of the best ways to experience Vail is by hiking. In the winter, many of the wilderness areas remain open for snowshoers or back-country skiers. Just a few of the popular trails are the nearby Booth Falls Trail, Shrine Mountain Trail, Missouri Lake Trail and Piney River Trail. Or take a free, guided hike with the Nature Discovery Center, perched at the top of the Eagle Bahn gondola. Pick from a variety of different hikes, from easy, family excursions to wildflower hunts. When the ski slopes shut down, Vail Mountain transforms into an adventure park. The Epic Discovery park, at the top of the mountain, features an alpine roller coaster, ropes courses, kids rides, warm-weather tubing, and ziplines. A highlight here is the four-hour ziplining tour that brings you through the mountains to see the region from bird’s eye view. If you're on a time crunch, even just a ride on the scenic gondola is impressive. Some of our favorite restaurants in Colorado are located in Vail. It’s hard to even narrow down the best, but three that rise to the top are Flame, Mountain Standard, and Sweet Basil. Can’t decide for yourself? Take a guided, walking foodie tour with Vail Valley Food Tours. Flame, located inside the Four Seasons, is a high-end steakhouse. After your dinner (Wagyu steak, anyone? ), hop over to the Four Seasons’ Remedy Bar, our favorite cocktail lounge in Vail. Get a seat on the outdoor balcony by the firepit and enjoy creative cocktails. And the best hot chocolate we’ve ever had. Mountain Standard, stationed in downtown Vail Village alongside the creek, is a relaxed, hip, foodie heaven, with a raw oyster bar, as well as innovative twists on your fave comfort food. Our top pick continues to be the pork shank. Sweet Basil, located upstairs from Mountain Standard, has been a staple in town for more than 40 years. It’s a little more upscale than Mountain Standard and the menu items are exquisite; we’ve never had a bad meal here. Or even an average one. Everything is precise. Get a table on the balcony overlooking the creek during warm weather. Beware of the high altitude, which can affect how your body processes alcohol. And with that warning in place, make sure to stay hydrated, eat plenty, drink slowly and hit up some of our favorite mountain bars, breweries, and distilleries. For a casual drink with the locals, hit up Vail’s 10th Mountain Whiskey and Spirit Company. This micro-distillery offers a tour of their spirit and history, right in downtown Vail. Vail holds a variety of fantastic festivals throughout the year. In summer, the streets are hopping with music, dance, and food. Every spring, don’t miss the popular Vail Film Festival, with movie premieres, panels, parties and the chance to meet a celebrity. One thing that makes the Vail Film Fest so exciting is it coincides with spring break in Vail and bookends the ski season for spring. Also, check out Vail’s Gerald R. Ford Amphitheater, an outdoor performance venue that brings in big-name performers and is the site of some of Vail’s most exciting events, such as the International Dance Festival. In the summer, the free weekly concerts of the Hot Summer Nights series are popular. Don’t let your trip to Vail be limited by town limits. There are endless outdoor experiences surrounding the ski town. Visit the 133,500-acre Gore Mountain range north of Vail, with tons of rugged trails, including some legit challenges that reward you with some of Colorado’s best views. There’s also the Holy Cross Wilderness Area, with more than 160 miles of trails just waiting for you to conquer them on bike or foot. Both are open year-round, although weather conditions may limit access to some parts.